Ocean cruises are a booming business, despite the constant need of rescue when boats take on water and the fact that everyone always gets sick. I’m surprised they still allow these plague ships to carry passengers out to sea. But if you have more faith in the cruise industry than I do, they are at least giving you a good reason to take a sideways skyscraper out to the middle of the ocean now. Disney has announced that its Disney Cruise Line will introduce a “Star Wars Day” into their vacation packages starting in 2016. 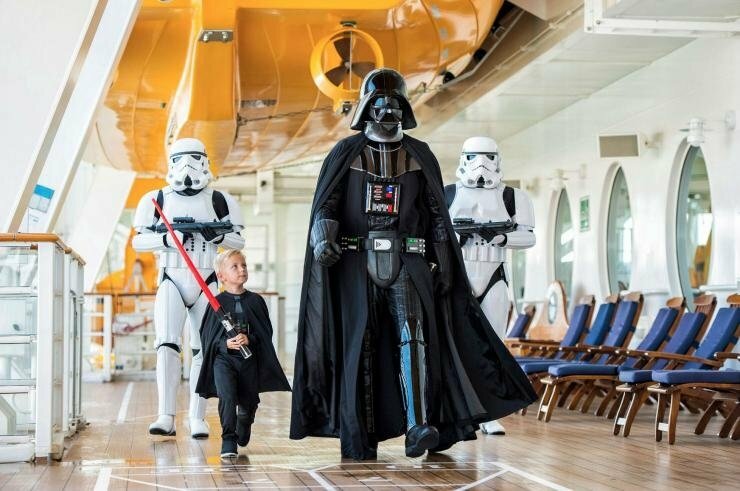 The “Star Wars Day at Sea” will take place on Disney Fantasy cruises that start on Jan. 9, Jan. 23, Feb. 6, Feb. 20, March 5th, March 19, April 2 and April 16, 2016. You might get sick, but at least you can have some fun with your sickness. …among other activities. You’d better book that cruise quick. And if I were you, I’d pack some medication, and a couple of lightsabers in case you run into any Imperial forces at sea.